DoD officials reassure legislators that the MHS Genesis roll out will pick back up with West Coast facilities in 2019, and that full deployment by 2022 is still achievable. Implementation of the Cerner-based system had been paused for several months to deal with issues at the program’s four pilot sites, including problems with e-prescribing, referrals, log-in time, and training. 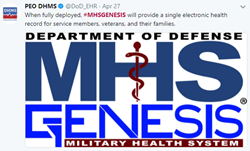 The DoD has been sharing its experiences with VA officials on a regular basis to prepare them for their own Cerner roll out, provided a contract is signed in the coming months as some still optimistically expect. The contract drama playing out in Illinois hasn’t swayed the majority of poll respondents to think more positively about the parties involved, though Cerner does have a slight lead in a vendor-to-vendor matchup (an outcome one reader has attributed to ballot-box stuffing). At this point, I have to wonder how in-the-trenches end users feel. Email me if you happen to work at the health system, or have experienced a similar situation at another organization and would like to share your thoughts – anonymously, of course. New poll to your right or here: Have recent privacy headlines impacted your interest in consumer genetic testing services? It seems we live in a time when data breaches are par for the course, and signing away your data rights just to trace your ancestry doesn’t give people as much pause as it should. I could offer a number of response options, but I’m keeping it simple with just three in hopes that you’ll explain in the comments why your interest has waned, stayed the same, or increased. 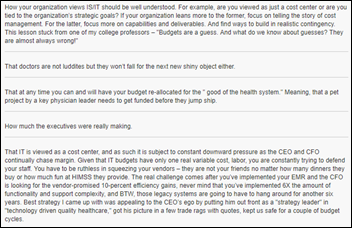 Check out reader responses to “What I Wish I’d Known Before … Creating, Defending, or Managing a Hospital IT Budget.” While I can’t say I’m surprised by any of them, I can say I appreciate the advice of “realistic contingency” from a reader’s college professor. This week’s question seems timely given the plethora of headlines surrounding government officials who are being shown the door through media (and Twitter) pressure. 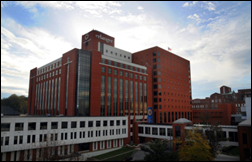 Erlanger Health System (TN) attributes its third quarter $4 million shortfall to a 10-year, $100 million Epic implementation that kicked off with inpatient services last fall. The system held off on billing during November as it worked through software issues, ultimately writing 30 million lines of code to resolve 15,000 workflow problems as part of an expected stabilization phase. The company expects to continue to rely on its core ambulatory and growing small-hospital markets. Management team and board member Dave Robinson and Chief Product Officer Kyle Armbrester have both left the company, with an ongoing search for a president progressing apace. Bush also points out that the company’s coordinator and inpatient software may have been brought to market too early. Sales and marketing spend may have been cut too drastically, though the company isn’t scrambling to adjust its budget yet. Its strategic overhaul of staff and spending is nearly complete. Cape Fear Valley Health System (NC) will replace two Cerner systems with Epic beginning in Summer 2019. Athenahealth SVP of Network Services Jonathan Porter takes on the role of chief product officer. In Montana, Billings Clinic notifies 934 patients of an email data breach that may have compromised patient names, birth dates, phone numbers, and some medical information. 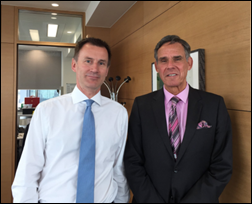 In the UK, Health Secretary Jeremy Hunt brings in Eric Topol, MD to lead a review of how to best train NHS staff on using new technologies including AI, digital health, robotics, and genomics. NHS is in the middle of its 100,000 Genomes Project, which aims to use genetic sequencing and big data to develop precision medicine programs. A new study in JAMIA finds that health system adherence to the ONC-funded SAFER (Safety Assurance Factors for EHR Resilience) guides developed in 2014 is lacking. Researchers found that only 25 recommendations were fully implemented at the eight health systems who participated in SAFER self-assessments. The study’s authors conclude that national policy programs are needed to ensure proactive SAFER assessments become a best practice. In his latest “Doctors Gone Wild” segment, Weird News Andy recounts the arrest of Georgia family practice physician Marian Antoinette Patterson, MD who threatened to slit the throats of her employees, and cut another’s head off for use as a hallway bowling ball. Her other unsavory activities, which some have attributed to intoxication but WNA thinks also exude a hint of physician burnout, include throwing water on employees and tearing her diploma off the wall and stomping on it. Surescripts will exhibit at the MicroMD User Conference 2018 May 2-3 in Warren, OH. Vocera Communications will host its first Chief Experience Officer Roundtable April 25-26 in San Francisco. KLAS recognizes LogicStream Health as a high performer in its latest report on clinical process improvement. Did Erlanger really write 30 million lines of code in less than a year? How many programmers did they have? We had hundreds of coders and we wrote a fraction of that. The whole Erlanger article makes no sense. There’s no way they wrote that much code, especially since it would have been Epic doing any of the coding for any enhancements. And the part about Epic recommending they hold all bills is just flat out wrong unless there was a major change in the recommendations in the last 2 years.